At the moment I have in my RV two standard solar panels (laminated in glass) and lead-acid deep cycle batteries (as far as I remember, AGM – absorber glass mat – type). I used both the standard solar panels and the flexible ones, so I have an idea on what are the pros and cons of two types of solar panels. The most important feature of the flexible solar panels is… the flexibility. What a surprise, right? They can be easily transported, they can be folded around a sleeping bag, attached to one’s backpack. Of course you can’t roll them to make a very small tube, as the photovoltaic cells will eventually break. But thanks to the small weight and flexibility you can use them to charge your cellphone or GPS receiver when camping in the middle of the forest (as long as you have enough sunlight there). My first solar setup - flexible 10W panel, lead-acid car battery and charge controller. The flexible solar panel I own is equipped with car lighter socket, so it can be used with all the electric devices that use car lighter as energy source. For example, all the car mobile phone chargers. You have to be careful, though. As far as I remember, the highest voltage you can get from such solar panel is roughly 18V, some chargers may not work at all or be destroyed. I found out that one of my car chargers won’t work attached to the solar panel unless I shade a part of the panel, which will lower the output voltage. I might change the angle on which the panel was located as well, so that it won’t get the maximum solar irradiation directly. Or I might attach the battery to a small 12V battery and charge controller, the battery would lower the voltage as well. 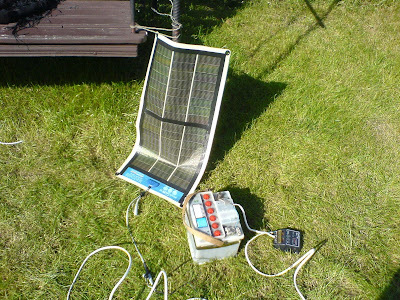 But carrying even a small lead acid battery makes this solar setup not easy to carry. The panel I own has four holes punched in the corners, so it can be easily hung on a string, or even on a tree branch. I carried it in my RV attached to one of the windows. Of course the flexible solar panels are built differently than the traditional ones. The flexible panel consists of two layers of very dense foil, while the traditional panel has a cover made from glass and aluminum. Of course, the flexible panels are much lighter, but also are not protected from the rough weather as well as the traditional ones. My traditional solar panels, laminated in glass. Such batteries are also much more expensive, than traditional. My battery can be now found on eBay at $160-170, which makes its unit price roughly $16-17/Wp. The traditional batteries are cheaper than $3/Wp. You won’t make a solar power plant out of the flexible ones. But they were not made for such purposes – they were made to supply power to tourists and maybe people aboard boats. Maybe, as I believe that traditional panels are better choice for yachts and boats.